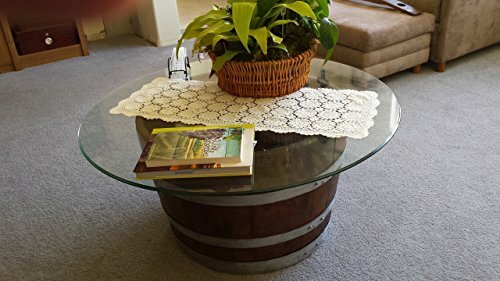 These exquisite half Decorative wine barrels are brought to another level as a coffee or end table. These reclaimed used wine half barrels are sanded, stained, sealed and varathaned, plus the hoop bands are cleaned up. We add a brand new beautiful 36" glass top to give you a one-of-kind look. The height of the table is roughly 18" tall, with the glasstop 36" in diameter. Noting that no two barrels are alike, the top of the barrel is lined with felt so as to keep the barrel from scratching the glasstop.